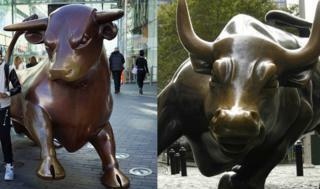 Image caption Can Birmingham's bull take on the Charging Bull of Wall Street? With plans mooted to move part of the Bank of England from London to Birmingham, could the second city's landmark bull be set to give the charging bovine of Wall Street a run for its money? Probably not. But the move - put forward by Labour - would continue Birmingham's history as a city at the centre of financial progress. Birmingham was once home to the world's oldest mint - founded in 1794 - creating currency for more than 100 governments. All modern coins can be traced back to those first produced in the city. And the face of Birmingham's future has pound signs in its eyes - with HSBC and Deutsche Bank both planning huge investment south of spaghetti junction. So how do Birmingham's financial credentials measure up? In the late 1700s, the city was a key part of the industrial revolution, and the home of Matthew Boulton. A businessman, his Soho Manufactory was the largest industrial complex in the world and he later developed his own mint, starting a regular coinage in 1789. The Royal Mint had stopped making copper coins in 1775 because they were not distributed beyond London and traders believed there were too many in circulation. The machinery used by the national mint needed four workmen to operate, which often meant each coin was struck slightly differently, some better than others and not all perfectly round, which made it easier for forgers. Boulton replaced workmen with steam power and used his new machine to strike coins perfectly each time. His 'cartwheel' design held back the forgers of the time. HSBC will open a new headquarters in Birmingham in the new year. The £200m base will employ about 4,000 people. When it was first announced, the bank said about 1,000 jobs would be transferred from London as part of the move, which began earlier this year. Antonio Simoes, of HSBC, described Birmingham as a "growing city" with the "expertise and infrastructure" to support the bank. Deutsche Bank chose the second city as the home for its expansion in trading operations. Image caption Birmingham is the largest city economy outside of London. Business is growing in the city. In 2016, Greater Birmingham Chamber of Commerce revealed that, outside of London, Birmingham was the largest city economy in the UK. Almost half a million people are working in the city. Economic output is also growing and reached £23.2bn in 2014. Birmingham City Council announced plans in 2015 to develop a new financial and business district. The Snow Hill Masterplan outlines 200,000 sq m of new office floor space, 4,000 new residential units and 10,000 new jobs created in the area over 20 years. It is already a major hub for the business, professional and financial services sector and is home to over 500 companies. And it isn't just big banks and companies that are fleeing London for Birmingham. More than 6,000 people left London for the West Midlands city in 2015, according to internal migration statistics. Tim Pile, chair of the Greater Birmingham & Solihull LEP, says Birmingham and its surrounding areas had the "critical mass" in financial services to welcome major employers, like the Bank of England. He said: "Greater Birmingham is renowned as an international hub for financial services, with a strong track record in attracting major businesses including HSBC, PwC and Deutsche Bank. It comes as no surprise that Birmingham is seen as a great location for the Bank of England to locate to. "Unprecedented investment has poured into Greater Birmingham during the past decade, which has been transformed to reflect the world-class nature of the businesses relocating here. "With the region's unparalleled connectivity and access to global markets set to be bolstered by HS2 and further infrastructure investments, its attractiveness to financial services firms shows no sign of slowing down. "Welcoming organisations like the Bank of England here will add to an already vibrant environment for businesses and the public sector."